Printer Installer is a web application that simplifies the deployment of shared printers and eliminates complicated scripts and GPO’s. Additionally, Printer Installer reduces help desk calls by empowering your end users to self-install printers with a web based self-service printer installation portal. 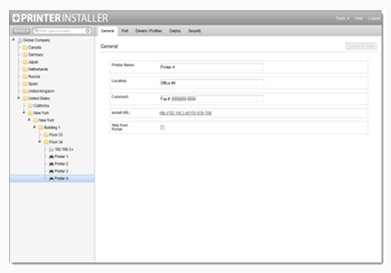 With Printer Installer, automating printer deployments to end users is easy. Help desk staff simply logs into the web based Administrator to create printer deployment assignments. Printers are then automatically installed on the end user’s computer. Simply add Active Directory user, computer, group, OU or container objects to the printer's deploy tab to deploy the printer. No scripts. No GPO's. Use the web-based Administrator to add and remove printer deployment assignments. Deploy printers to members of Active Directory user, computer, group, OU, or container objects. Wake Forest Health installed Printer Installer to eliminate GPO's and complicated scripts. Now they use Printer Installer to deploy over 6400 printers to their 37,000+ users. Westchester Community College uses Printer Installer to simplify deploying printers to end users, eliminating complicated scripts and slow processing printer deployment GPO's.